Pioneers in the industry, we offer paraffin gauze dressing b.p., surgical gauze dressing, orthopedic soft cast dressing and chlorhexidine gauze dressing from India. Packaging Size 1 Piece of pouch, 10 piece of pouch, 10 pouch per box etc. We are the leading manufacturer , Supplier and Exporter of Paraffin Gauze Dressing B.P. 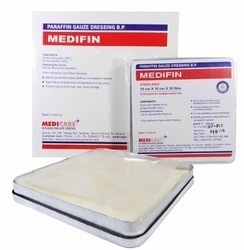 with the Brand Name of Medifin., With wide expertise in this domain, we bring forth a quality-approved range of Paraffin Gauze Dressing B.P (Sterilized By Gamma Radiation). These are considered one of the simplest way of protecting the burns and infections. This entire range is manufactured from the high quality range of material in order to provide utmost relief to the patients. Our professionals make sure to deliver these products within the committed time frame so as to win the trust and satisfaction of the customers. We are one of the most reliable companies in this domain and are into offering Surgical Gauze Dressing. 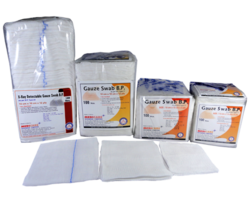 We are one of the most reliable companies in this domain and are into offering Paraffin Gauze Dressing B.P. We are one of the most reliable companies in this domain and are into offering Orthopedic Soft Cast Padding. 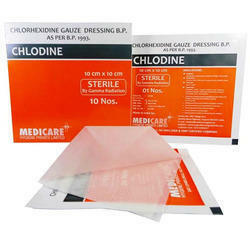 We are one of the trusted manufacturers, suppliers, wholesalers and exporters of a quality- assured range of Chlorhexidine Gauze Dressing. Our offered range of products is manufactured from the leno woven cotton fabric and soft paraffin. The entire array of these offered products is widely demanded in the medical industry for various applications. Our professionals ensure to manufacture the entire assortment of these products as per the specified standards and norms of the industry. Chlorhexidine acts as a soothing agent. The antibiotic/antiseptic in it helps in the healing process. Interlocking gauze yarn threads, minimize when dressing is cut to shape. Does not stick to the wound and does not disturb the dressing process. Due to special type of butter paper loss of medicine after removal of butter paper is minimum.